Ok mom, let's talk about nitrous oxide (laughing gas) and your kids. Is it a good idea? As a dentist in Spanish Fork, I see a lot of kids. Last night I was thinking (stressing actually) about a couple of little kids I have coming up on my schedule. Yes, troublesome isn't it? Some dentists can't get dentistry off their minds. Why was I "stressing" about these little kids? They are small, 4 and 5 years old. They have 2 and 3 cavities that need to be fixed. They were very nervous, but cooperative, at their cleaning appointment. Their teeth actually looked very clean and well kept. I was surprised to see cavities between their little baby molars (#flossing). I told their parents about the cavities. Most parents first question whether or not "baby teeth" need to fixed at all. It's a legitimate question. If the teeth are within 6 months (Maybe a year) of falling out, then we just hope they fall out before they start hurting. Baby molars fall out when kids are 10-12 on average, these little ones will need to keep these teeth for 5-7 more years. So we need to fix them or they will abscess eventually. When I told the parents we would use nitrous oxide (laughing gas) during the procedure, the parents were adamantly against it. They didn't want their kids to have any nitrous. 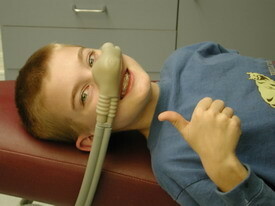 Some kids can do it without the nitrous, they are not the ones that are nervous during a cleaning appointment. If kids struggle during the cleaning they need nitrous, maybe even sedation with the pediatric dental specialist. As most people can attest, it only takes one bad experience at the dentist to create some moderate to severe dental anxiety. When you are 5, it is very easy to have a "bad experience". Then that person has dental anxiety, often for the rest of their life. Nitrous oxide helps avoid (not 100%) those bad experiences. So next time your child needs some dentistry. Even if it is just a couple of fillings, please consider letting your child use the nitrous. It makes for a better dental visit for everyone, the dentist, the child, and you as the parent. Nitrous is very safe. There are very few complications to using nitrous. Almost all of them come from chronic abuse, and severe over use of nitrous, or from mixing nitrous with ambient room air instead of pure oxygen. Certainly those things shouldn't happen in a dentist office. Too much stress at the dentist office is bad for everyone. I just finished up some fillings on a 9 year old girl. She had 2 cavities. We sat her in the chair and started a movie for her on our IPAD. We rubbed the topical anesthetic on her gums. She seemed to be in a trance watching the IPAD, like a tractor beam. I carefully tried to sneak in the injections. She didn't feel the first shot, but she did feel the second. Instantly she was screaming and crying. I used a piece of gauze to dry the tears from her face. I asked her mom why we were not using nitrous oxide (laughing gas). Mom replied, "Oh I just don't like that stuff. It makes her weird". 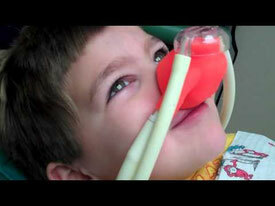 Yes, nitrous oxide does make people feel weird, it is also excellent at relaxing people, especially little kids. I worry that young girl will struggle (possibly for the rest of her life) every time she realizes she needs treatment at the dentist office. The remainder of her visit was just as difficult as the beginning. Every time we tried to put anything in her mouth she panicked. More tears, more screaming, more jumping and pulling away, more stress on everyone. These kinds of visits happen more often than anyone would like, many of which could be avoided. Contrary to popular belief, dentists don't like to hurt people. If there is a way to make our patients more comfortable, we would like to use it. Is nitrous a guaranteed way to not feel the shot? No. It does help a lot of people through an anxiety filled surgical procedure. It's not just the relaxing feeling they feel while breathing the nitrous. That little nose sits up just high enough for those little ones to not see what we are doing, starting with the shot. When we do fillings, crowns, extractions, root canals, etc. we are doing surgery. The less they see, the less they worry. I have to say some people still can't make it through dental visits even with the nitrous. In those situations other types of sedation (moderate and general) are available. The days of forcing kids to hold still while they are scared or in pain need to be over. Too many adults avoid the dentist all together because of a bad experience they had as a child.